Having More Checking Accounts at Multiple Banks? Can You Have Checking Accounts at Multiple Banks? Most people only have accounts at one bank because it simplifies the banking process. It is easier to have the majority of your accounts in one place so that your transfers and payments go through more quickly. Banks count on customer loyalty, which is why they recruit so heavily on college campuses. They know that once you open your first bank account with them, you are much more likely to stay there, despite any fees that are charged. However, you should do a banking checkup once a year, to make sure your needs are still being met. It is possible to have checking accounts at more than one bank, and you may have specific reasons why you want to do this. For example, you may choose to keep your personal checking account open when you open a joint account with your spouse at a different bank. You may have one checking account at a separate bank to pay your collection bills from so that they do not drain your checking account of more money than you authorized. You may have a different account for your small business or freelancing work that you do under your name. You may also have a savings account at an online-only bank to earn higher interest rates. Each of these reasons is a legitimate reason to have multiple checking accounts. It is important that you manage each your accounts carefully so you do not overdraw one account accidentally and run up overdraft charges. Keep your checkbooks in separate places, and choose different distinct checks for each account. If you are allowed to choose the style of your debit card, make sure that they are different so you do not grab the wrong one when you are making a payment. You should balance your checkbook each month and keep a running total of your transactions so you do not overdraw. Checking your transaction online every few days will help you catch a mistake early so you can correct it before it becomes serious. 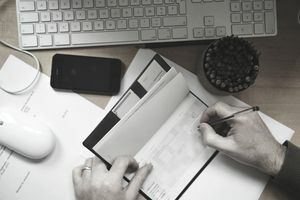 If you are transferring money in between accounts, you can do this online if both banks have that option available or you can do it by making a deposit using a check from the other bank, you should be sure to wait three to five business days to make sure the check has cleared before using the money. If you want to speed up the transaction, you can use cash. When you choose a new bank, you may look for specific services they offer that your current bank does not. Some banks may offer a lower interest rate on car loans if you have a checking account with them and will set up an automatic payment for the loan. This is a good reason to open a new account. Over time you may find that you like the new bank better and want to transfer all of your accounts to the new bank. It is not difficult to close your old account if you decided to do that. Be sure that you transfer all of your payments and direct deposits to your new account before you close your old account. A separate bank account for a business is a good idea because it will help you keep your business finances separate from your personal finances. You may find a smaller local bank offers better services for your business, but you want to keep your personal account at your original bank. It is important to keep your business account very separate from your personal account, and you should write yourself a paycheck each month, instead of dipping into your business account to pick up small items you may need. It is more common to have an online savings account at a bank that is separate from the bank you have your checking account with. Online banks often offer higher interest rates on savings account, and it can be worth the extra money you earn. Be sure that the online bank is insured by the FDIC and that it will guarantee the money you have in savings there. Each bank has different policies surrounding their checking accounts, and you should understand each policy for the different accounts you have. This can help you save money in fees, as you maintain the minimum required balance, and avoid other monthly service fees the bank may charge. Even different accounts at the same bank may have different service fees and rules. Is Using an Online Bank a Good Idea? Can't Open a Checking Account? Here's What To Do.